Phosphorus is an essential element for the body. It is important for carrying various functions of the body. If your body lacks Phosphorus, your body will not be able to function normally. It is needed for the activities of the brain, blood, heart, kidney and other parts of the body. It is an important chemical element and is denoted by the symbol P. It has atomic number 15. It is highly reactive. So, it is never found in its free state on earth. You can see minerals containing Phosphorus. There are two kinds of Phosphorus on earth. One is red Phosphorus and the other is white Phosphorus. Phosphates are constituents of the DNA, RNA and ATP, as well as the phospholipids. Urine and body ash also contain Phosphorus. Phosphorus is the second most abundant mineral found in the body after calcium. Phosphorus gets absorbed in the blood in the intestine. For the absorption of Phosphorous it is important that calcium and Vitamin D are present in adequate amounts in your body. 85% of the total Phosphorus found in human body is present in the skeleton. 14% of this element is found in the soft tissues such as the muscles. 1% of the phosphate in human body in the blood and body fluids. Phosphorus is an essential element in many of the proteins. It is also essential for healthy bones and teeth. The structure of teeth and the skeleton is made of this element. Phosphorus is needed for the transfer of energy within the cell. It is also important for all functions of the body. Phosphorus is an important component of DNA. DNA cannot be formed without this element. Absorption of vitamins, especially Vitamin B, is promoted by Phosphorus. As you know, vitamins are essential for the proper functioning of the body. Phosphorus helps in repairing the various body cells that undergo daily wear and tear. It makes sure that the cells are well developed and are functioning actively. You need Phosphorus for proper mental functions. By consuming Phosphorus you can improve your concentration, memory and other functions of your brain. An adequate level of Phosphorus helps in improving cognitive growth and the development. Deficiency of this mineral in the body can lead to an early onset of neurological diseases like dementia and Alzheimer’s. It can also increase the chances of cognitive malfunctioning. Phosphorus is needed for creating the energy that is used by the body for its various functions. It helps in the flow of energy and makes sure that every organ in the body uses it efficiently. It helps in breaking down the nutrients by releasing the energy in the food that you consume. It prevents you from getting tired or weak. If you have an adequate amount of this mineral in your body, you will be able to stay alert and energetic. Some of the minor problems like muscle weakness, numbness, impotence, sexual weakness, loss of libido, frigidity, sperm motility etc can be treated by consuming adequate amounts of Phosphorus regularly. All chemical reactions taking place in the body need Phosphorus also. Phosphorus is also needed for proper digestion. It stimulates the digestion of riboflavin and niacin effectively. It can help in the treatment of indigestion, constipation, diarrhoea etc and also helps in toning up the digestive system and ensuring proper movement of bowel. It improves the health of your digestive system. Phosphorus is very effective for balancing the level of hormones in the body. By ensuring that balanced amounts of hormones are present in your body, it makes sure that your reproductive organ remains healthy and functioning properly. 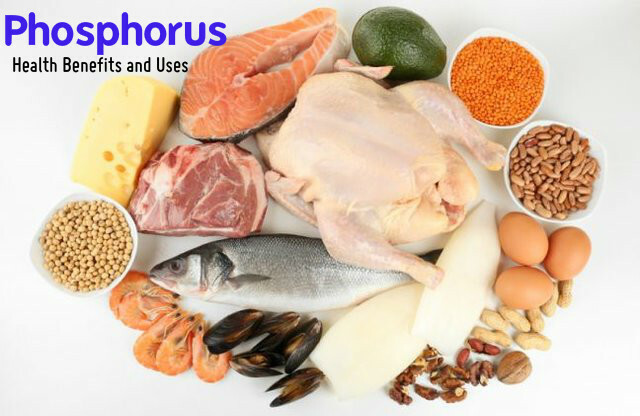 Phosphorus also helps in controlling the production and release of hormones by interacting with the endocrine glands. Phosphorus is also needed for the production of proteins. Our body grows and maintains itself with the metabolism of protein. Phosphorus also helps in the process of reproduction. Your body can use carbohydrates and fat better if you have adequate amounts of Phosphorus in your body. Most of the Phosphorus in your body is needed for the bones and the teeth. So, you should make sure that you get enough Phosphorus. Along with calcium, Phosphorus is also essential for strong bones and teeth. This is required the most during puberty stages. Women need them in good amounts during pregnancy and menopausal stages. Phosphorus helps in the remineralisation of the teeth and the bones. You need adequate amounts of calcium and Phosphorus for preventing osteoporosis. If the ratio of calcium to Phosphorus is high, it can interfere with the growth of bones. Phosphorus is effective for preventing tooth decay and problems of the gum. For the proper functioning of the kidney and for keeping your kidney healthy, you need to have Phosphorus in adequate amounts in your body. Phosphorus makes sure that there is proper elimination of the waste from the kidney. It helps in balancing the level of uric acid in the body by increasing the quantity and frequency of urination. It keeps your body toxin free and also regulates he fluid level in the body. So, you can see that Phosphorus is very important for the body. Deficiency in Phosphorus can cause various health problems like arthritis, breaking of bones, bone pain, anorexia, nervous disorders, obesity, nervous disorders, irregular breathing, rickets, mental and physical exhaustion, pain in different parts of the body and so on. However make sure that you consume it in adequate quantities only. Too much of this mineral can affect the levels of calcium. Junk foods contain too much of phosphorus in them. So, avoid consuming too much of junk foods and sugary foods. Foods in which Phosphorus are found are nuts, melon, meat, fish, egg, sunflower seeds, pumpkin seeds etc.